What has happened to the thousands of Bosnians, Croatians and Serbians swallowed up in the Balkan war of the 1990s, never to be seen again? Matt O'Brien, ex-United States Senator and former Vietnam POW is a member of an international commission charged with sifting for clues. Outraged by the commission's inaction, O'Brien teams up with radar engineer Hank Wilson. Together, they embark on a high tech probe of Bosnian killing fields. As they delve into the core of devastation, they unearth secrets that threaten their own lives and could re-ignite the smoldering, fragile peace. 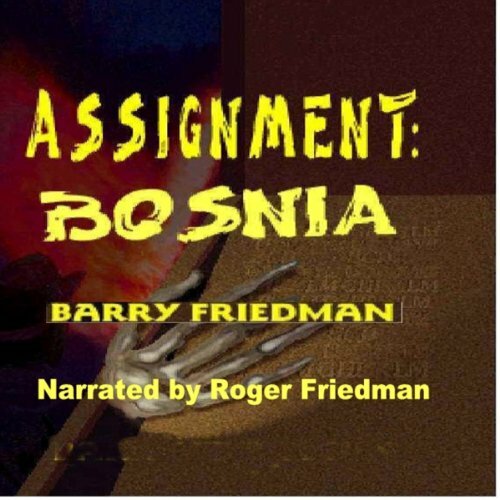 “Assignment: Bosnia” is a fictional story of an American’s investigation of ethnic cleansing in the former Yugoslavian territories. It is more of a radio play than an audiobook. The author, Barry Friedman paints a picture of American embassy ineptitude, local police ineffectiveness, and Serbian atrocity. The hero of the story is an ex-Vietnam officer who has recently lost re-election to the Senate and is offered an assignment to Bosnia to investigate missing persons from the Balkan wars. Friedman’s story is about Harrison-Ford-like’ adventures of this former Senator. Friedman’s writing is unexceptional but he shows how aerial reconnaissance became a useful tool in finding mass grave sites that were denied by the Serbian government. Through a combination of aerial imaging, thermal data, light detection and ranging technology–software algorithms are created to find mass grave sites. At best, Friedman’s story reminds one of the terrible consequence of the disintegration of Yugoslavia. It is a story of events that are repeating themselves in the Middle East and parts of Africa. Anarchy, as well as bad government, can lead to ethnic cleansing and brutal internecine warfare. “Assignment Bosnia” is not well written but it sheds some light on the plight of Balkan citizens in the last years of the twentieth century.